One of the foundation stones of American high-end, conrad-johnson has returned to its core recently. 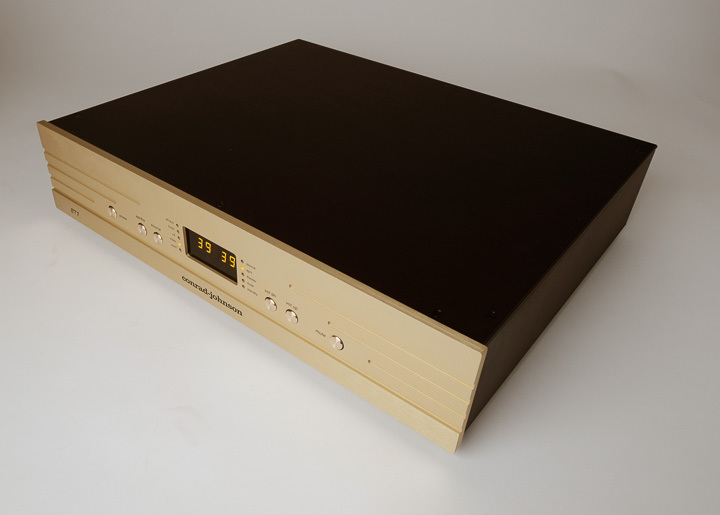 The company built its reputation on high-performance tube (valve) amplification, and although subsequent diversions into solid-state, and digital audio have often been greatly received, it’s those deceptively simple, high-performance tube line-stages, phono stages, and power amplifiers that are first to pop into your head when the c-j name is uttered, and it’s those products – and those products alone – that form the company’s 2018 line. The new ET7 line preamplifier is central to that line, doubly so in fact. It’s the middle out of three preamplifiers from the brand, and as a control amplifier represents the nerve centre or hub of any multi-source system. On the other hand, it owes so much to the flagship GAT preamplifier, I’m probably not the first to think of it as ‘baby GAT’. That ‘ET’ prefix to the name means ‘Enhanced Triode’, in that the circuit uses a single 6922 double triode tube, acting as a single-ended triode for each channel. This provides voltage gain, and sends the signal to a similarly minimal high-current MOSFET buffer, which helps provide a very low output impedance. This makes the single-ended only ET7 extremely flexible in terms of interconnect cable design and length. DC voltage is provided by a discrete voltage regulator that isolates the audio circuit from the power line by maintaining negligible impedance across the audio frequency band. In addition, infra-sonic noise is minimised by operating the tube heaters on a DC voltage supplied by a separate regulated power supply. All of which is a direct ‘trickle down’ from the design developments that took place in moving from the original GAT to the GAT Series 2. The ET7 retains the microprocessor-controlled relay system and network of metal-foil resistors as its gain control, allowing one hundred 0.7dB steps in volume and balance. The preamplifier has five single-ended line inputs, and two external processor loop input/outputs, the second of which puts the preamp into ‘Theater’ mode and automatically switches the ET7 to unity gain. Unlike the entry-level ET3, there is no optional built-in phono stage, but there are two standalone phono stages in the range. Also unlike the ET3, the ‘balance’ control on the remote control actually works, even if there is no replication of that balance control on the ET7’s front panel! As ever with c-j, volume is displayed by a pair of two-digit yellow LEDs in the centre of the front panel, and these are flanked by yellow LEDs to denote source and function. Power up puts the ET7 into soft-start heat-up mode, and the blinking mute switch is a reminder of that.